This is a relatively new approach. 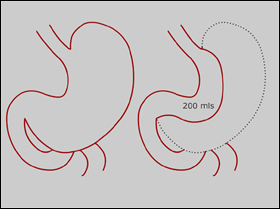 It is the first component of the duodenal switch operation and involves removing the lateral 2/3rds of the stomach with a stapling device. It can be done laparoscopically (keyhole surgery) but is not reversible. It basically leaves a stomach tube instead of a stomach sack. are at a safer weight.